A few weeks ago, Pope Francis accepted the resignation of the former Archbishop of Washington, DC, Theodore McCarrick, because of allegations of sexual misconduct. Pope Benedict had disciplined the late Cardinal Keith O’Brien, leader of the Church of Scotland, because of past sexual misconduct. Lately, Archbishop Charles Scicluna was sent to Chile by Pope Francis to investigate the cover-up of Fr Fernando Karadima, who was accused of abusing minors. These individuals at the very top of the Church hierarchy are among those who have abused others. Unfortunately, as the story keeps on unravelling we are discovering that the list is never ending. This is the sin most talked about, albeit not the only one committed by members of the clergy. In this new scenario of the Church, many Christians feel confused. ‘Scandalised’ is the precise word understood in its Greek etymological sense, a stumbling block that a person hits and trips over. Such conduct is not to be expected of these people. However, although this misconduct has done a lot of harm to the Church, the attempt to cover it up has been much more damaging. The fear that if people become aware of these grave sins this would diminish the authority of the Church is uncalled for. One causes a scandal when one presents oneself as pure when one is not. As a matter of fact, the Church is finding itself in much more trouble because of the cover-ups than because of the offences themselves. Together with the resignation of Cardinal McCarrick, the Pope also accepted that of Archbishop Philip Wilson of Adelaide. Archbishop Wilson’s guilt was related to a cover-up, not sexual abuse. The same applies to Archbishop Juan Barros of Osorno, Chile, investigated by our Archbishop. Admitting the presence of sin in the Church should not harm the Church. 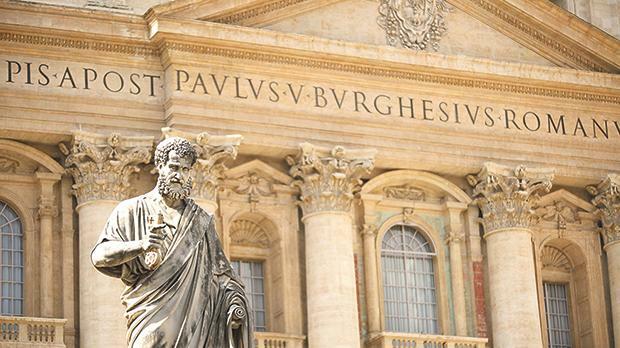 After all, St Peter, the very first head of the Church, was a betrayer of Jesus. Jesus knew it and still chose him as the rock on which he built his Church. Christians should aspire to holiness, but becoming holy needs time and God’s grace. As St Paul says: “Not that I have secured it (perfection)… but I am still pursuing it” (Phil 3,12). Pope Francis is doing his best to project a new image of the Church. His definition of the Church as a field hospital goes in this direction. A field hospital is full of injured people who need looking after and healing. On this concept of Church he is building his theology of mercy. My hunch is that those who find it difficult to accept the pastoral consequences of this theology have not understood the true nature of the Church. It is not true that a ‘sinful’ Church cannot preach the way of the Lord. The Church can still fulfil this mission, provided that whoever preaches conversion would have himself or herself in mind as the first one who needs it. Mature people are not scandalised. Take potholes, for instance. If we acknowledge the fact that they are there, we won’t fall into them and wreck our cars. If we pretend that they are not there because they should not be there we would end up their victim. The same applies to the Church. All of us Christians who are trying to live the Gospel remain imperfect human beings – priests, bishops and cardinals included. That is why we talk of “a Church in pilgrimage”. We’re not there yet! All of us need God’s mercy because, as we acknowledge each time we pray the Hail Mary, we are all sinners.